"I have stood by gravesides in Africa of a group of Christians who had been attacked because of something that had happened in America." If the Church of England accepted same-gender marriage, "the impact of that on Christians far from here, in South Sudan, Pakistan, Nigeria and other places would be absolutely catastrophic." "While the Archbishop is right to point out that LGBT activists in the Church should be aware that their words and actions can cause unintended harm to others around the world, he should take his own advice and realize that his words can likewise cause harm -- to the millions of LGBT Anglicans and wider LGBT community around the world." Archbishop Welby, do you blame Bishop Robinson, the first openly gay Episcopal bishop in America, for giving extremists an excuse to kill Christians? 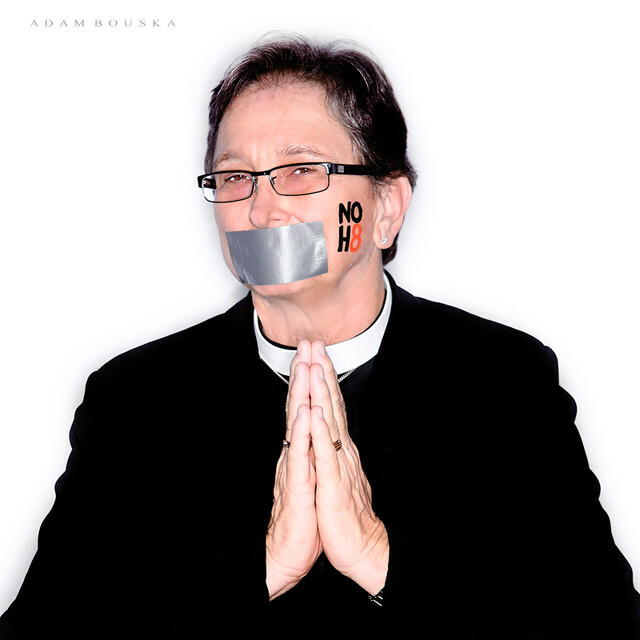 Bishop Robinson risked his own life by coming out. Death threats caused Bishop Robinson to wear a bulletproof vest under his vestments at his consecration. Gratefully, there was no catastrophe at his consecration, but it was a catastrophe when David Kato, a Ugandan gay activist, was brutally murdered in his own home. At David's graveside stood Bishop Christopher Senyonjo, the only Anglican pastor in Uganda who was willing to eulogize David. Days before, an open invitation to violence had been published in a local newspaper with names, photos, and home addresses of Bishop Senyonjo and David Kato, alongside dozens of others, under the headlines of "100 Homos" and "Hang Them!" with a picture of a noose. Today, anti-gay strategies continue to escalate. Odious laws were passed in Uganda and Nigeria, and politicians are fomenting hate in Ethiopia, Kenya, and across the continent. Bishop Senyonjo and people who are sexual minorities are vulnerable to mob violence. People are being forced from their homes, and too many are being beaten or murdered in the streets or thrown into prisons to rot. Archbishop Welby, do our lives count? Do you know who is fomenting fever-pitched marches calling for our elimination? It is overwhelmingly Christians. Mobs led by people who claim the title "Reverend" can quickly become judge, jury, and executioner. Sadly, they ignore Jesus, who embraced people who others condemned. Jesus gave us the commandment to love one another -- and commanded us not to judge one another. As the global head of Metropolitan Community Churches (MCC), I know how MCC was formed 45 years ago in the fire of persecution. Lives were lost. Bishop Senyonjo's work at the St. Paul Center for Reconciliation is also being forged in the crucible of unjust laws and mob actions. Together, we stand firm in the belief that God's love is for everyone, regardless of sexual orientation or gender identity. With both Bishop Senyonjo and Bishop Robinson, we share the heroism of the moment when we know God has called us to take a stand -- even at the risk of our very lives. Today, MCC is present in 40 countries, including Uganda, through our congregational outreach and Global Justice Institute. Archbishop Welby, will you stand with us? Will you be at our gravesides and mourn our loss? Or will you stand back and say, "Too bad. I wish I could have done something." You are part of the same communion with Bishop Robinson. Can you affirm his humanity and the humanity of all LGBTI Christians -- and all LGBTI people around the world -- by defending our lives? You are a colleague of Bishop Senyonjo, but you have never stood by his side to lay hands of blessing on those who worship in his community. You have never offered the wine and bread of communion to their hungry souls. Like Peter, you pretend you do not know us. But the crucified Christ is still with us. When faith leaders deny our existence, deny our faith, and deny our lives, they are handing us over to be persecuted and killed by those whom they are supposedly leading. There is nothing right about Christians being killed because they are an oppressed minority, but that does not make it right to hand over LGBTI people to extremist Christians who believe we are supposed to be stoned. No matter how many times someone stands up with blood on their hands and says, "I massacred this Christian because you allow two people of the same gender to marry each other," it does not make it true. People kill because of hate. There will always be an excuse or a scapegoat, but the scapegoat is never to blame. The blame lies with those who hate -- and those who are afraid to lead people away from a season of hate. True leaders take a stand against hate in all its forms. They lead with prophetic love and justice. How will this "Tale of Three Bishops" end? It remains to be seen. Bishop Robinson continues to live his life to open the doors of churches. Bishop Senyojo continues his ministry, despite Ugandan laws that call for imprisonment for even expressing support for the equality of LGBTI people. In Uganda, many LGBTI people have fled. Some have gained asylum; others are in hiding. Many LGBTI leaders, like Bishop Senyonjo, refuse to leave their beloved Uganda. They stand strong and use moral persuasion and the courts of law to challenge this tidal wave of oppression. Archbishop Welby, will you speak out for us? Will you use your power to defend those who writhe under the heel of Christians who selectively cite the Bible? Or will you huddle by the fire in the courtyard and deny us over and over? Remember, it was Jesus himself who said, "When you have done it to the least of these, my brothers and sisters, you have done it unto me."